What a kick in the knickers. My declaration that The Black Onyx was Sega’s final SG-1000 game was a bit premature, it seems. 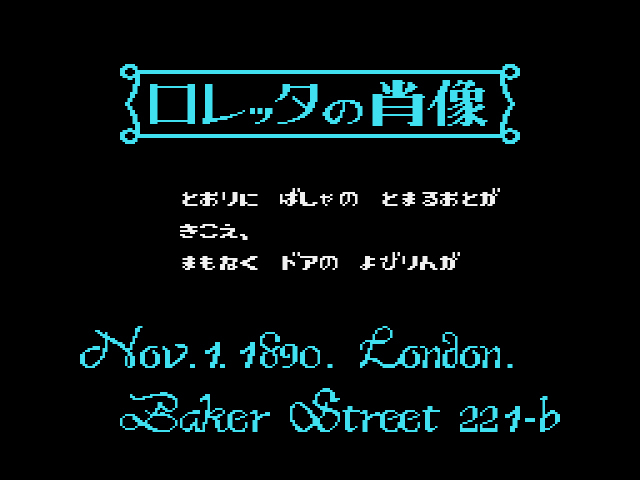 Though Loretta no Shouzou: Sherlock Holmes was classified in Sega’s own database as a Mark III game, one look at the title screen’s light blue tones reveals the skeletal design of an SG-1000 title. 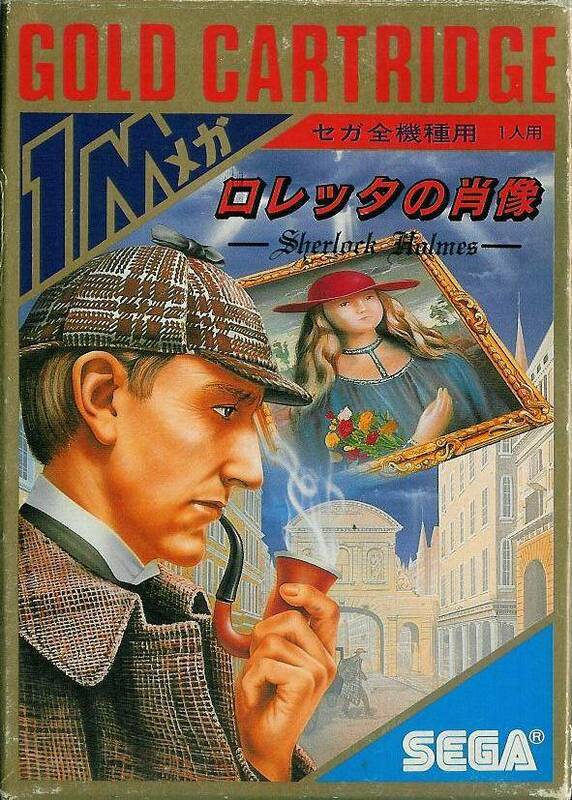 It’s elementary, my dear readers: Sherlock Holmes is an SG-1000 game packaged as a Mark III title. Holmes even received gold Mark III packaging, as opposed to the typical black SG-1000 boxes or the blue Sega My Card boxes that were so fashionable in the last year of the SG’s life. Good on Sega, I say. This is what they should have done with The Black Onyx since both it and Sherlock Holmes were released in 1987 (the year after the SG-1000’s last hurrah in 1986). Baker Street, huh? Doesn’t ring a bell. But why did Sega feel the need to hide an SG-1000 game in Mark III packaging? I doubt they were trying to trick their small consumer base. If anything (and this is speculation), Sega didn’t want to package Holmes to die as an SG-1000 game. The SG-1000 was over before it began, frankly, but it was all but a memory by ’87. Nevertheless, Sega still put a lot of hard work into some of the system’s games, Loretta no Shouzou among them. I imagine the company labeled the game as a Mark III title because they wanted their current fanbase to experience the most ambitious game for the SG-1000 – ambitious enough that, graphics aside, the game wouldn’t feel out of place on the Mark III. While there are three chapters in the game, Sherlock Holmes only focuses on one sprawling case: the recovery of a stolen piece of artwork known as Loretta’s portrait. The case takes you all across London into the homes of wealthy urbanites and poor farmers alike. Just look at this map! You can visit every single one of those squares. I don’t care where you’re from, that’s impressive, even by Mark III standards. Of course, you don’t need to visit all those areas. If you’re only looking to find the portrait, you proceed in the direction the clues lead you, nowhere else. If, however, you want to immerse yourself in the grimy backdrop of 18th century England, you have the power. As you might expect for a game based on a Sherlock Holmes case, Loretta no Shouzou is a text-based adventure. 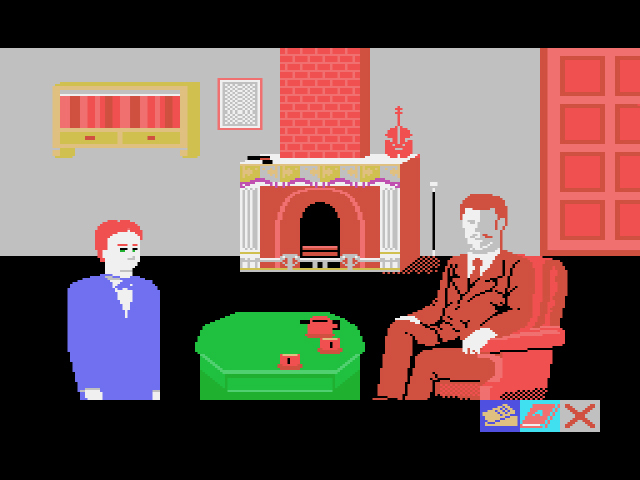 You begin in Holmes’ parlor with only some money and an address book on your person. A man known as “Clay’s brother” stands before you. He tells you about Loretta’s portrait that’s gone missing in Clay’s art gallery, and he asks if you would be so good as to find it. Holmes accepts, and the game is afoot. Once Clay’s brother leaves, a command menu pops up, showing you options like ‘Ask,’ ‘Take,’ ‘Examine,’ ‘Use,’ etc. The options are all related to interacting with the scenery shown on-screen. 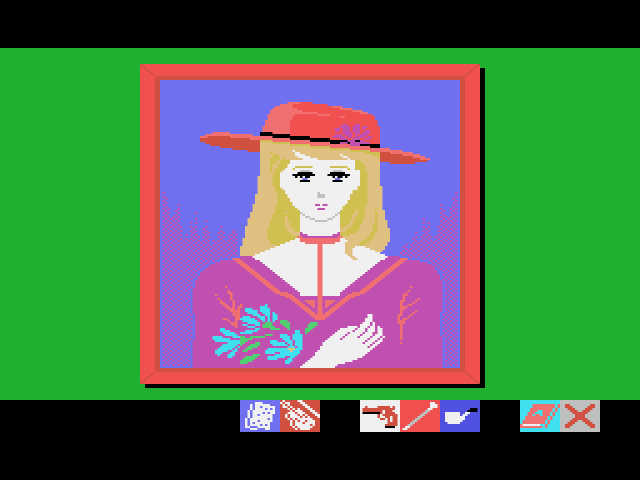 For example, if you select ‘Take,’ another menu pops up with the options ‘Screen’ and ‘Back to Commands.’ Select ‘Screen’ and a hand appears on-screen, allowing you to interact with whatever you choose, including Holmes’s own inventory. There’s also a second command menu you access by pressing Button II, with options like ‘Invite,’ ‘Enter,’ ‘Move, ‘Operate’ that are used for navigating Holmes. These menus are the game – nothing happens without your interacting with them – but one should expect nothing less from a virtual adaptation of Sherlock Holmes. Yup, that’s London for you. The only “problem,” if you will, with Loretta no Shouzou is that all the text is in Japanese. The dialogue, the menu options, everything. There is no English patch available for the game either, so if you want to play it properly, you’ll have to learn basic Japanese or rely on the lone FAQ written by Lynn Brown over on GameFAQs. The FAQ does a good job at guiding you through the basics, but it only covers the elements crucial to beating the game, nothing extra. As helpful as the FAQ was to get me through the game, relying on someone else’s interpretations left me feeling disconnected. I didn’t use my mind to solve the puzzles or to figure out where I needed to go next. Ms. Brown’s words were my eyes, but looking from the text to the screen, back and forth, was a mechanical, laborious process that produced little enjoyment. In the end, I appreciated the game’s atmosphere, over-serious tone, and grand scope, but nothing else. Loretta is the founding member of the Red Hat Society. Obviously, this isn’t Sega’s, Ms. Brown’s, or even my fault. I don’t know Japanese, thus I can’t properly enjoy a text-heavy Japanese game (one of many to come, Lord have mercy). Is Sherlock Holmes: Loretta no Shouzou a worthwhile adventure game? Probably! 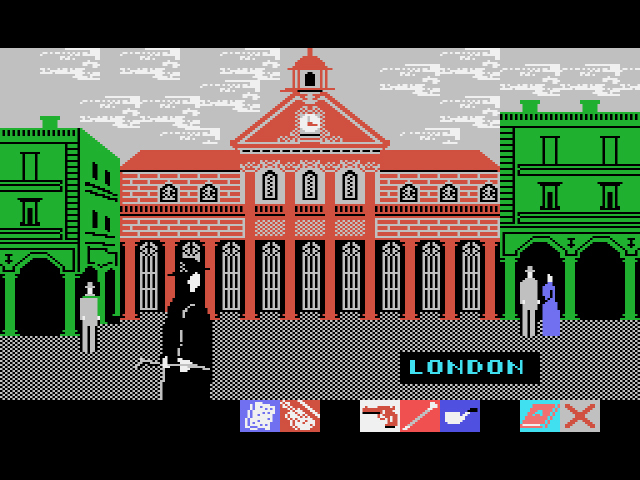 I can’t testify to the game’s ability to guide you with proper clues and direction, but the amount of detail and life that went into London and its many citizens is astonishing, given the console’s limited tech. 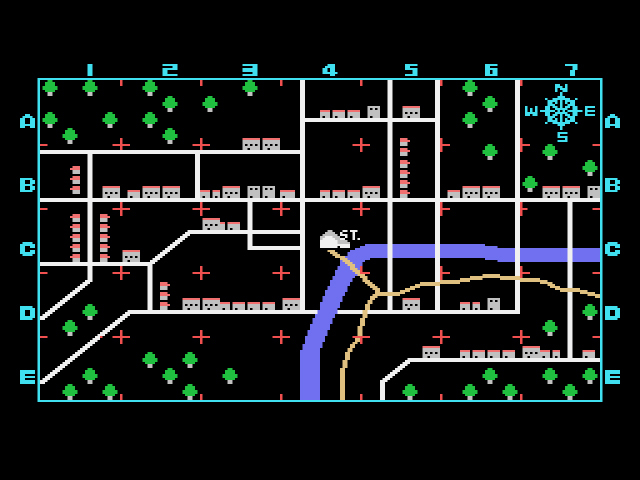 If nothing else, I implore any curious reader to venture around the map for awhile and take in the sights. Unless you can read Japanese, though, or are less sensitive than I about using an FAQ to play the game for you, there’s no reason to trudge in vain through Loretta no Shouzou. Admiration is one thing. Exhaustion and fatigue, quite another. I think you’ll find text heavy games like this few and far between until the Saturn. Then prepare for a sea of them. I can’t wait for the Japanese-only Koei games. And by “can’t wait,” I mean, I wish they didn’t exist. Just think: if you had decided to cover all NES/Famicom games worldwide and not just the US releases, we’d have a couple of hundred of these posts, because boy does the Famicom have a ton of text adventures and RPGs that no one has translated yet. Yeah…I’ll leave that to Chrontendo. I hope you can! I wish more people had the language skills/time to make it possible. On the subject of Koei text heavy games. Might be an idea to head over to Sega 16 and see their review of Romance of the Three Kingdoms IV on 32x. The guy used the SNES version and Saturn versions simultaneously with the 32x version to get a review wrote, not sure if you want to go to these lengths but I thought it was ingenious. I’m surprised Sherlock Holmes was popular enough in Japan to warrant a Japanese only text based adventure as it’s very ‘English’. That’s very, uh, industrious of said gentleman. Not sure I’ll go to those lengths, but perhaps if I have the time. Yeah, I was surprised that Japan liked Holmes, as well. Then again, who wouldn’t like Holmes? He’s a boss in any culture. That’s very likely. There were lots of other Japan-exclusive Sherlock Holmes games, for example for the FC, most of them being adventure games, naturally. In general, murder mystery genre was extremely popular at the time in Japan, due to Portopia’s success mostly. As such, there are tons of games like that for the FC and some later consoles.